While living in Sucre, Bolivia I have adapted to a more closed-minded atmosphere than what I am used to, showing me how different parts of the world may think and act. 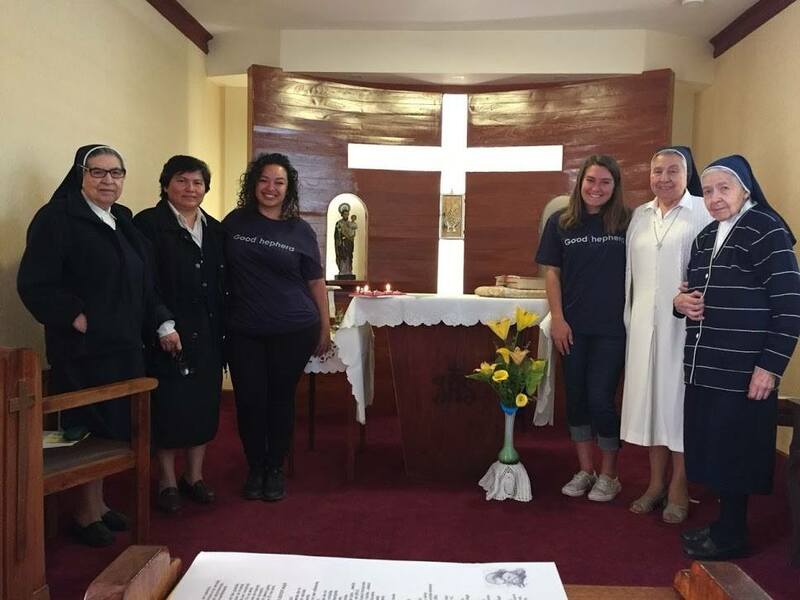 However, Hermana Verónica (Sister Verónica) is a beautiful open-minded Bolivian soul who has allowed me to have someone to go to for guidance, advice, and faith, while working with oppressed communities in this culture. I appreciate her focus on life, and for that reason I chose to interview her about her ¨yes¨ to religious life and other aspects of becoming a Sister. Q: How was your childhood? Was it religious? How was your family? A: Hermana Verónica took her vows at the young age of 26; however, she explained to me that she felt spiritual, religious and the presence of God from the young age of 6. She knew she had this feeling, but could not completely understand it. When she received communion, there was no preparation and no schooling. Her church did offer preparations, but they felt the children did not want to understand or would not understand. So, she simply learned how to receive the Eucharist without any knowledge of why. As a little girl, however, Sr. Verónica felt God was speaking to her and could feel Him explaining to her why this sacrament was important. The story continues to her Confirmation, when she also did not feel prepared, but knew it was the right thing for her because God was telling her. She explained her purpose in life was to work for the love and strength of God – she felt she was put on this earth to fulfill His work. This became difficult for her because she grew up in a family which did not value religion, and they were not the ones influencing this value she had discovered on her own. Then, when Sr. Verónica was in high school, one of her cousins entered a convent. This particular convent would not let the women leave the building in which they stayed, only to pray all day. This knowledge of the convent life actually turned Sr. Verónica away from thinking that would be the life she wanted to live forever. However, because she had this idea of vocation in her mind and the lifestyle of prayer interested her, she was determined to discover more about religious life. 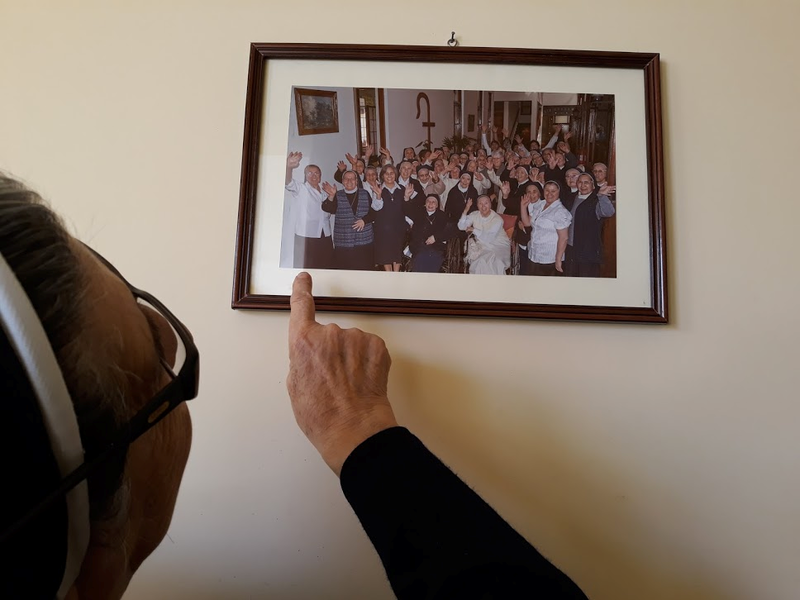 Hermana Verónica pointing herself out in a photo of an old Good Shepherd Sisters reunion. Q: Did you ever date or have thoughts of marriage and children? A: After high school, Sr. Verónica became a first grade teacher. She met a friend there who she connected with, and her friend also felt the same strong religious experience she felt. One day she met a boy named Alberto, and she felt a strong connection to him. Her friend, however, warned her and told her if she went to parties with him until late at night, she would not be respecting her religious call. Sr. Verónica explained how she loved dancing (but never drinking), and felt a curiosity towards Alberto. She needed to discover for herself if a relationship with him was the right thing for the rest of her life. She and Alberto were together for three years before they had to move away from each other due to family reasons. They continued to write to each other, until their distance had grown strong and he started seeing another woman. At this moment Sr. Verónica said she needed to discover herself and continue discovering her religious journey. Hermana Verónica with her community of Good Shepherd Sisters renewing her vows. Q: What did your parents and friends say when you decided to enter religious life? Were they proud? Worried? A: Since Sr. Verónica’s family was not as religious as she was, it came as a shock to them. When she explained to them that she would be leaving Alberto, they did not understand why. In their minds, he had been the perfect gentleman, provider, and was strong, loving, and caring towards her. Her mom, dad, and siblings could not understand how she would be leaving to discover religious life when she had, what they perceived as, a perfect future as a wife with Alberto. Sr. Verónica quickly became stern with them and explained how she felt this was right for her, even though it pained her to see how little support they offered her at the beginning and how sad they were to see her go. 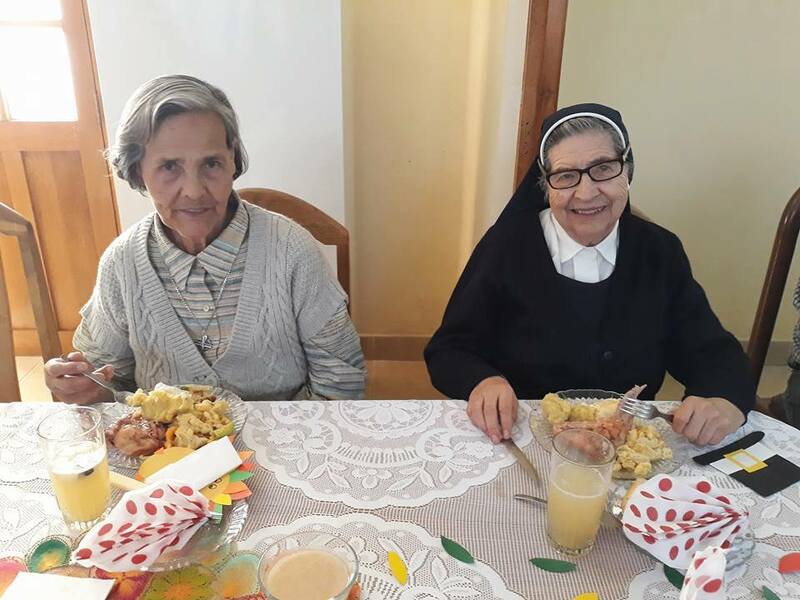 Hermana Verónica (right) with her community member Hermana Victoria, enjoying a United States Thanksgiving meal! Q: How were you first years in community life? What types of jobs did you have? A: Sr. Verónica described that, just like any community, there would always be differences in opinion while living with other people. I could resonate with this statement because living in community life as a volunteer, I understand what it feels like to have differences in opinion and having to compromise on how something should be done. She explained how their strong love towards God has always kept her and her community members close, and how beautiful it is to see each individual person create their own relationship with God. I believe this statement also relates to volunteer life because each individual volunteer is finding and creating their own journey through their volunteer experience. Watching your community member(s) grow spiritually, mentally, and physically, is one of the benefits of this experience. One of Sr. Verónica’s first jobs as a sister was working in a group home for adolescent girls who had recently been incarcerated. She was a supervisor of the Project, and helped the girls learn responsibility and life skills before they were immersed back into society. She continued this path by working with others in need throughout her life as a sister. Hermana Verónica is a shining example of how to love all of God´s children. Her love for God is so strong, and she shows it in many different ways. She is always making me and my community member, Andrea Gaitan, laugh, smile, learn, and appreciate the little things in life worth having. She loves to dance and have fun, and whenever she gets the chance, she insists on giving us Bible Study lessons. Living and working with Sr. Verónica and the Sisters of The Good Shepherd has given me life long lessons and skills I will never forget.